The Patron Saint Feast of the Holy Cross, the International Altruism Festival, Restaurant Week, the Wind Festival, and the Jarretaderas Shore Fishing Tournament are among the events expected to attract thousands of visitors. Every month the Groups Desk at the Riviera Nayarit Convention and Visitors Bureau helps out with the organization of events to increase the number of activities that can be enjoyed in the destination. In the month of May, these serve to extend the high season that begins in April with Holy Week and Easter. 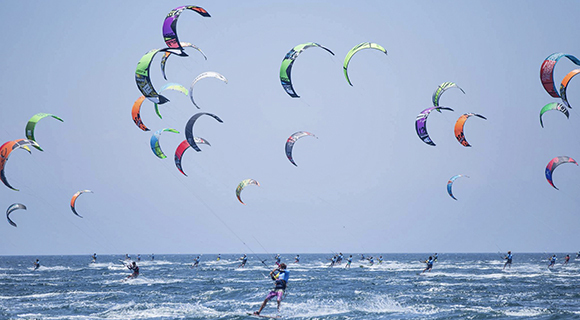 This is without a doubt one of the destination’s anchor festivals and it’s among the top 10 best of the year thanks to its wow factor, the amount of participants and, above all, the perfect conditions for kitesurfing in both Bucerías and La Cruz de Huanacaxtle. Shore fishing tournaments are held year round in different villages around the Riviera Nayarit, with Jarretaderas next on the list. The entire purpose of the exercise is for families to come together and have a great time while the participants show off their fishing skills.